Dale Denton (Rogan) is a total stoner who accidentally witnesses a murder involving a cop and a drug lord. He turns to his weed dealer, Saul (Franco) for help and the two of them have to flee. 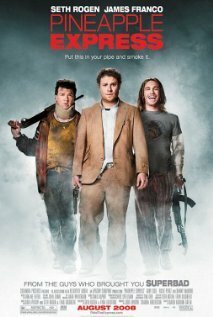 They are betrayed by Saul’s dealer and friend Red (played by Danny McBride) who is the middle guy selling this particular weed called the Pineapple Express. They are hunted down by members of the drug gang and aren’t quite smart enough to outrun them (because they are always stoned). There are car chases and shooting and lots and lots and lots of pot smoking, making some of the action very funny. The whole thing ends at the drug lord’s pot lair where there is a major shoot out with the waring Asian syndicate. This is quite a different film for Rogan who, although often portrayed as a stoner in other films, has probably not seen this much action. He wrote the screenplay as well as taking the leading role with Franco. I don’t know how the guy has enough time in his life! This film has been classified as comedy, action and crime. However, I have classified it as a Bromance as there is a lot of relationship issues going down between Dale and Saul who become BFFs, and later with Red who joins in. Dale has a girlfriend who plays a minor role, as the real relationship issues are between the boys. This is a fun watch and worth a go.